Cookie Doh Co is something all those people with a sweet tooth out there have been looking for! Now it can be delivered straight to your doorstep! For those who loved to lick the spoon clean after mum finished beating a cake, this childhood experience continues to tempt adults to this day and Cookie Doh Co is here just to bring back the memz! Melbourne based siblings turned entrepreneurs, Chris, Alex and Jessica Reece, spoon-licking is no foreign concept. It’s an impulse hatched from warm-hearted childhood memories of culinary delights, delicious kitchen creations, and endless days of mixing, baking and devouring mouth-watering cookies. Now all adult Australians can enjoy Cookie Doh Co, edible cookie dough inspired by American FMCG cookie dough. Cookie Doh Co comes in three delicious flavours, Chocolate Chip, Apple and Cinnamon, and Triple Chocolate. The ingredients are completely free from eggs and pasteurised substitutes. 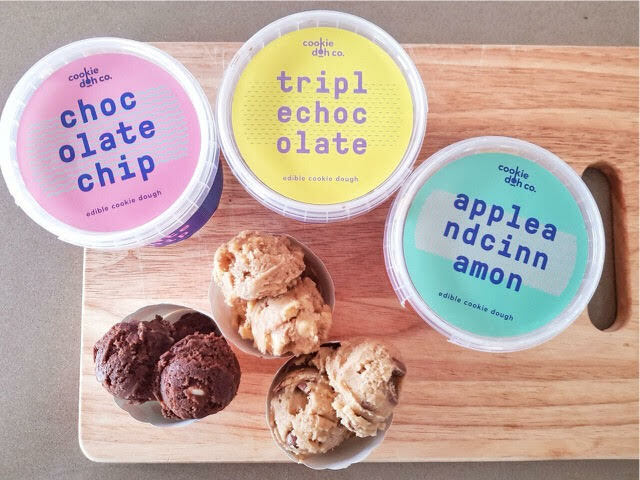 Cookie Doh Co is made from lab-tested, heat treated ingredients that allow the product to sit unrefrigerated in ambient temperatures for up to two weeks. Or if you prefer to keep refrigerated upon receipt up to three months in temperatures less than 4 degrees Celsius. The best part about the delicious treat is you can enjoy it on it’s own or add it to a culinary kitchen creation for a burst of extra flavour. This cookie dough can be used in fun and unconventional ways – just start getting creative! Each flavour in the range retails for $8.99 rrp (250g) and available nationwide via the website! Next Next post: Technogym Now Compatible with Apple Watch!